Cuban nickel production and the Sherritt-Cuba joint venture should have good prospects in view of Cuba’s large and low-cost reserves of nickel. Sherritt’s technology and probable future demand. However, there are a number of looming issues that darken the horizon for Sherritt and to a lesser extent for Cuba including high transportation costs – shipping nickel/cobalt concentrate from Cuba to Fort Saskatchewan Alberta – together with the “Helms-Burton” status of the mine, and future price levels and volatility.. The Moa mine and processing facility, with a 25,000 ton capacity, were initially constructed by US interests – the Moa Bay Mining Company, a subsidiary of Freeport Sulphur. They used proprietary technology from Sherritt, which had pioneered hydrometallurgy processes at their plant in Fort Saskatchewan Alberta. Extraction and processing began in 1959. The Government of Cuba then expropriated the operation without compensation in August, 1960 and restarted it in 1961 producing concentrate for the Soviet Union. The US Foreign Claims Settlement Commission (US FCSC) valued the company at US$ 88.4 million at the time of the expropriation. Sherritt’s direct connection with Cuba began in 1991 with purchases of Cuban nickel concentrate for its Alberta refinery. 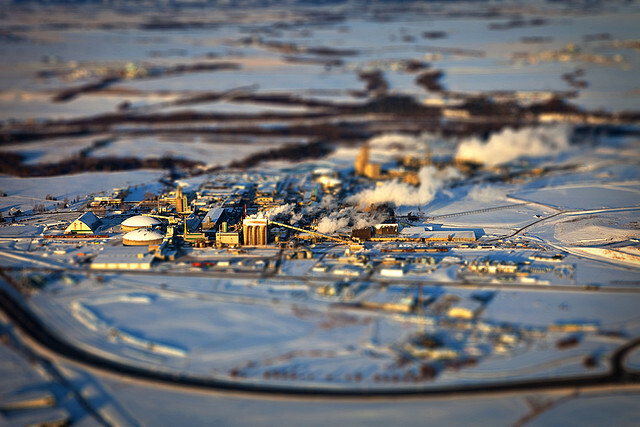 Sherritt had had insufficient volumes of concentrate for many years and in 1990 a refining contract with INCO expired. In 1994, Sherritt International and the Compania General de Niquel of Cuba established a 50/50 joint venture, which now owns the Moa extraction, processing, and smelting operation, the Alberta refinery and the international marketing enterprise. 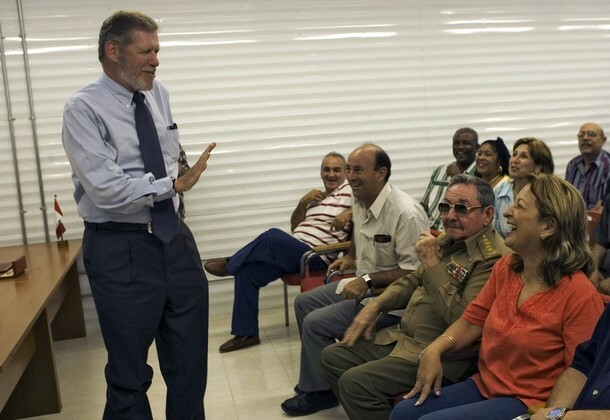 The former President of the company, Ian Delaney, also negotiated agreements with the Cuban Government, permitting Sherritt to enter other sectors of the economy, including electric energy, oil and gas, agriculture, tourism, transportation, communications, and real estate. By 2000, Sherritt International had become a major diversified conglomerate in Cuba. The joint venture between Sherritt International and the Government Cuba is a cooperative masterpiece. It has generated great benefits for both parties. The linking of the Moa nickel deposit and part of Cuba’s processing capacity with the Alberta refinery and its access to attractive energy sources was a stroke of genius and/or good luck for Sherritt and Cuba. Cuba acquired a market for its nickel concentrate. It acquired access to the technological improvements that have occurred from 1959 to 2016. These have generated improvements in productivity, energy efficiency, environmental impacts, and health and safety. It acquired Sherritt’s managerial know-how which. Together with technological improvements, have increased production from around 12,500 tons in the early 1990s to around 34,000 tons in the 2010s. The Government of Cuba is now the joint owner of a vertically integrated nickel operation, from extraction and concentrating through to refining and international marketing. Cuba also has obtained new technologies and managerial skills for oil and gas extraction and utilization, as well as electricity generation. Cuba’s nickel reserves are fifth largest in the world and production volumes are 10th largest. 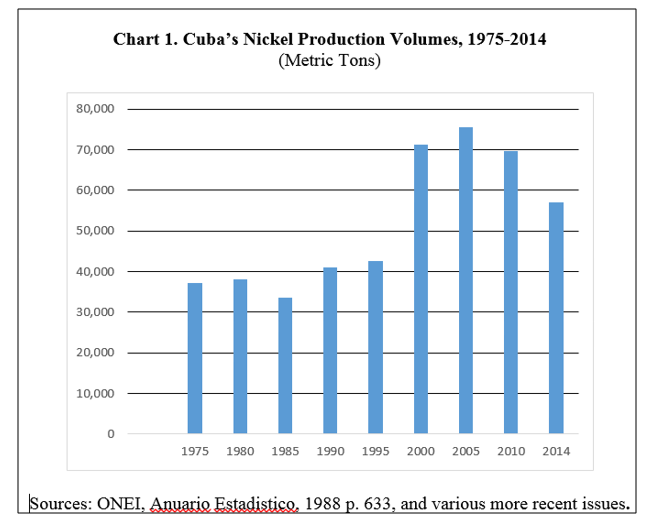 [i] Nickel has been Cuba’s largest merchandise export since the collapse of sugar by 2002. Foreign exchange earnings from the Sherritt-Cuba joint venture’s share of nickel and cobalt exports have averaged about 40% of total nickel/cobalt exports. It is not surprising that Ian Delaney became known as “Fidel’s Favorite Capitalist”! For its part, Sherritt has been able to maintain its Canadian refinery and to use its base in nickel to enter other sectors in Cuba. Its earnings from its Cuban operations are significant. The joint venture has been able to increase metal production and achieve high net operating earnings, which have been in the area of 40 to 50 percent of the company’s gross revenues for most years, depending on international nickel prices. The following chart illustrates Cuba’s total nickel production volumes. The impact of Sherritt’s innovations in increasing production volumes in the second half of the 1990s is apparent. In February 1998, Sherritt acquired a 37.5 percent share of Cubacel, the cellular telephone operator in Cuba for $US 38 million, but this was resold. “Sherritt Green,” a small agricultural branch of the company, entered market gardening, cultivating a variety of vegetables for the tourist market. 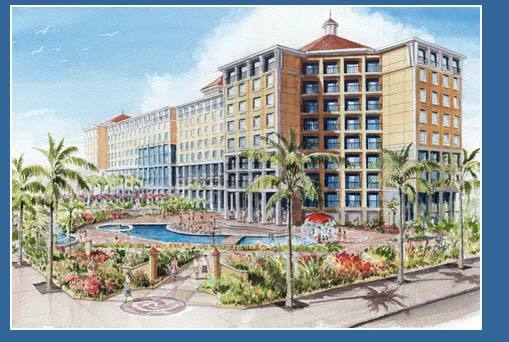 Sherritt also acquired a 25 percent share of the Las Americas Hotel and golf course in Varadero and a 12.5 percent share of the Melia Habana Hotel, both of which were managed by the Sol Melia enterprise but these also have been divested. By 2010, Sherritt’s Cuban operations were large and growing. Gross revenues reached CDN $1,040 million in 2008. However, there are a number of clouds on the horizon for Sherritt. 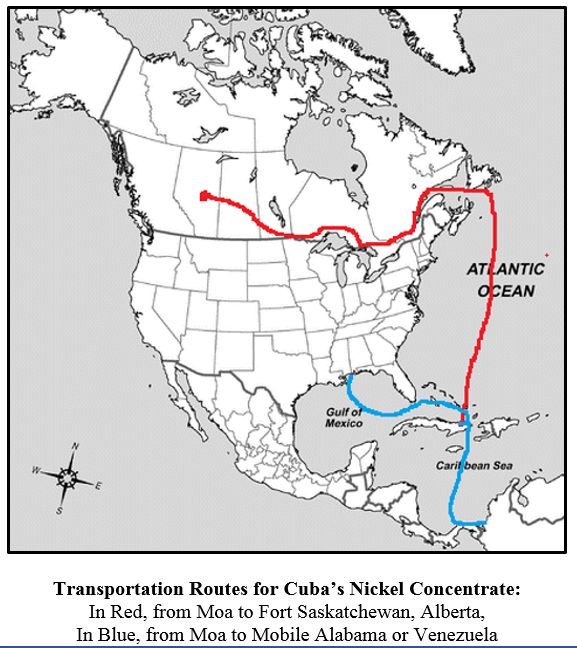 First, Cuban nickel concentrate is transported by ship to the east coast of Canada and then overland to the Alberta refinery. This makes some sense economically when energy prices are low. So far, the existence of the refinery there has compensated for high transportation costs. However, if – or when –transportation costs rise with higher energy prices or when full normalization with the United States occurs or when the existing plant reaches the end of its useful life, would a different location become more attractive? Energy sources are also available in Venezuela as well as the Gulf of Mexico region of the United States or could be transported to Cuba itself in future. At some point it will likely make sense to relocate a refinery to a locale closer to the nickel ore body. So far, Cuba is tied to the Canadian location through its 50% joint ownership of the Alberta refinery. But would Sherritt relocate the refinery to a lower-risk Cuba at some time in the future, or to the post-embargo United States or a post-Maduro Venezuela? Perhaps. However, Alberta will continue to have competitive energy prices and low risk to compensate for its locational disadvantage for some years to come. The second possible problem for Sherritt is that the Moa mine and the concentration plant are “Helms-Burton” properties for which there are US claimants. What would be the current value of the Using the US FCSC interest rate of 6% per year of non-payment, the 2016 compounded value would be a whopping US$ 2,054.6 million. Obviously there will be a negotiations problem for this and all other such claims. 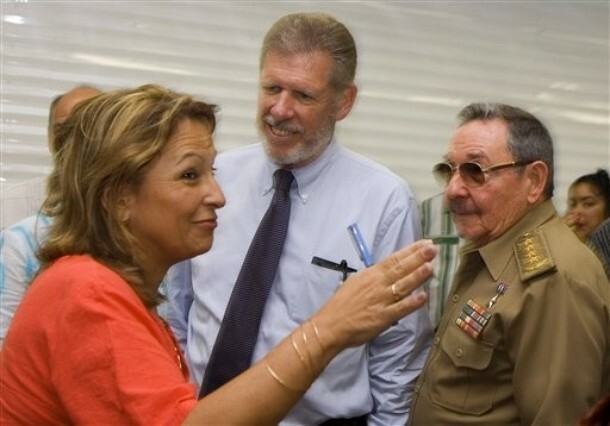 Resolution of the compensation claims issue with full US-Cuba normalization may require Sherritt and the Government of Cuba to negotiate some sort of compensation package for the original US owners. In one scenario, the US claimants would simply take over the Cuba-Sherritt operation in Cuba. But this would not be reasonable because at this time, the refinery for Cuban nickel is in Alberta and it is jointly owned by Cuba. My guess, however, is that Sherritt, the Government of Cuba and the US claimants will negotiate an arrangement that will be reasonable for all parties. In any case, the claim of US interests on the mine property generates ambiguities and uncertainties and will be problematic at some time in the future. Sherritt International may well be one of the few economic interests that perhaps could lose from US-Cuban complete economic normalization. A resolution of the property claims issue may turn out to be very expensive for Sherritt. .
A technological advance in the production of “Nickel Pig iron” (NPI), a substitute for refined nickel-steel alloys for some uses where high quality is less necessary. “Nickel pig iron” may well have already captured a portion of the nickel market for low quality alloys. In future, it may reduce the demand for nickel thereby placing downward pressures on nickel prices. This will likely reduce and Cuba’s foreign exchange earnings and Sherritt’s revenues and profits from nickel exports in future. As illustrated in Chart 2, nickel prices spiked in the boom of 2003-2007 – helping to generate a period of relative prosperity for Cuba – then declined in the recession of 2008. 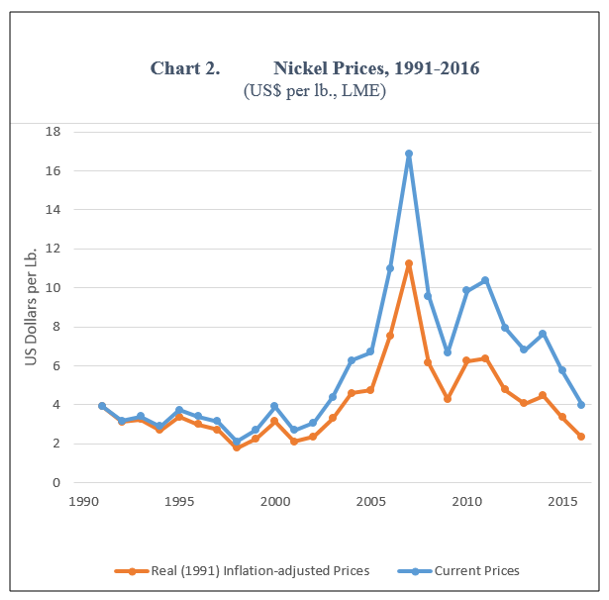 What is striking at this time is that in real inflation adjusted terms, the price of nickel in 2015 and 2016 is pretty much where it was in the 1990s. A number of factors are contributing to this of course, especially the growth rate deceleration in China reducing the demand for nickel. Is “nickel pig iron” also contributing to weak demand for nickel at this time? What will be its impact in future? Source: United States Geological Survey, Minerals Information, Nickel: Statistics and information., various years. The “real” or “inflation adjusted” price is the US consumer price deflator. On February 24, The Cuba Standard published an analysis by Jorge R. Piñón by on Cuba’s energy sector focusing in particular on Sherritt International, which has a joint venture in oil extraction and refining, natural gas, electric power and nickel mining, concentrating, refining and marketing. 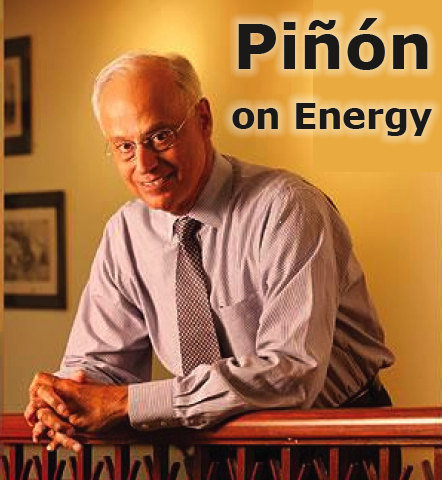 An introduction to Piñón’s analysis is presented below. Crude oil: Crude oil prices reached this week a 30-month high of nearly $100 per barrel, with industrial residual fuel oil prices close behind at a 28-month high of $80. These price increases are reflected in Sherritt’s year-end 2010 financial reports released today. Sherritt and Cuba do not realize the true value of the island’s crude oil production — based on its refined products yield — because Cuban crude is used directly as industrial fuel for electric power plants, instead of optimizing its inherent value by processing it into high-value refined products such as gasoline, diesel and jet fuel. Cuba’s realized crude oil value could substantially rise if it was able to market its crude oil to U.S. Gulf Coast refining companies.Realized prices should also rise once Cuba is able to monetize its heavy-oil production in planned conversion facilities at Cienfuegos and Matanzas. High oil prices negatively impact Cuba’s balance of payments in two ways: Not only as the value of its crude oil imports from Venezuela under the 2000 Convenio Integral de Cooperación services for oil barter agreement increases, but also as it has to purchase part of its domestic crude oil production from Sherritt. We estimate that the total value of Venezuelan petroleum imports and the purchase of Sherritt equity production for 2010 will be approximately $2.894 billion. Nickel: The good news is that nickel prices also reached this week a 24-month high of $13 per pound, an increase of 177 percent from a low of $4.50 in February 2009. However, this is still far from the contract record high of $24 a pound in May 2007. Canada’s Sherritt reported nickel and cobalt revenues for 2010 of $453.1 million, reflecting a 29-percent improvement over 2009 revenues of $350.7 million. The reported figures only reflect Sherritt’s 50-percent interest in the Moa/Saskatchewan nickel joint venture with Cubaníquel; therefore a similar improvement should mirror its Cuban partner operations. 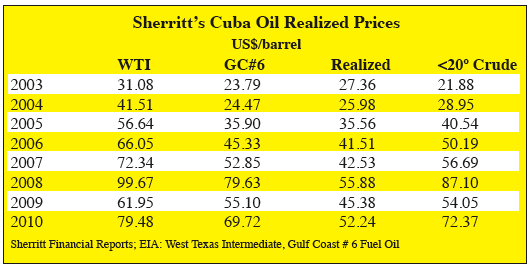 Cuba and Sherritt offset receivables between Sherritt’s nickel and crude oil operations, therefore alleviating Cuba’s crude oil negative cash flow impact on the national balance of payments.